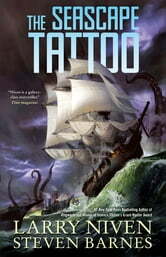 The Seascape Tattoo: the latest spellbinding adventure in Larry Niven's acclaimed collaborations with Steven Barnes. Aros of Azteca and Neoloth-Pteor are the deadliest of enemies: Swordsman and Sorcerer, locked in mortal combat, who have tried to kill each other more times than either can count. But when the princess Neoloth loves is kidnapped, there is only one plan that offers any hope of rescue . . . and that requires passing off the barbarian Aros as a lost princeling and infiltrating the deadliest cabal of necromancers the world has ever seen. They cannot trust each other. They will betray or kill each other the first chance they get. But they're all each other has.